Hello PHG readers! I’m coming over from my blog, Prodigal Pieces, to share with you a sweet DIY that is easy to whip up and will make everyone smile (not to mention it makes a perfect last-minute gift!). Do you remember the days as a child when you would stumble and hurt your knee or have some bump that required a little TLC? As a mom to 6 wonderful kids, I know how precious those times can be, and that’s where Boo-Boo Bear (a rice ice and heat pack) can sweeten those troubled times. Boo-Boo Bear is sweet little friend who serves as a comforting ice pack that is the perfect temperature for those bumps and bruises that come along, AND he can also be lightly warmed in the microwave to soothe aches and pains. Want to make one for a special little person in your life? printable pattern *this pattern is for personal use only, not for resale. Print the pattern (provided in the materials list) and cut out the pieces. Trace the pattern using either a pencil, tailor’s chalk, or white colored pencil on the fabric designated by the pattern. When you’re happy with the layout, apply glue to the pieces and assemble the face. Leave the ears and cording (hair) for the next step. After the glue has dried, place your ears and hair on the face pointed inward as shown making sure they extend past the edge about a quarter of an inch. You will be sewing the bear together and want to make sure that you catch all those pieces. Place the other brown velour circle on top of the bear’s face with velour side down and pin to secure. Using your sewing machine, stitch around the circle beginning at the bottom using a half to a quarter inch seam allowance. I like to make sure those ears and hair are secure because we know those little ones will be carrying it by those pieces, so I do an extra back stitch over those parts. Continue stitching. Leave a one inch opening so you can turn the bear right side out. To make sure your seams lay flat, carefully take your scissors and snip the seam allowance around the circle. Be careful not to cut your stitches. Turn the bear right side out and roll a piece of paper to make a cone to fill the bear with rice (any rice will do). Fill the bear full of rice until he is nice and plump. Using a needle and thread, hand-stitch the bear closed making sure it’s good and tight so no rice can escape. We all know how un-fun picking up rice can be. For a touch of whimsy, I like to take a toothpick and apply a small glimmer to Boo-Boo’s eyes and nose. A little touch of paint will do perfectly. 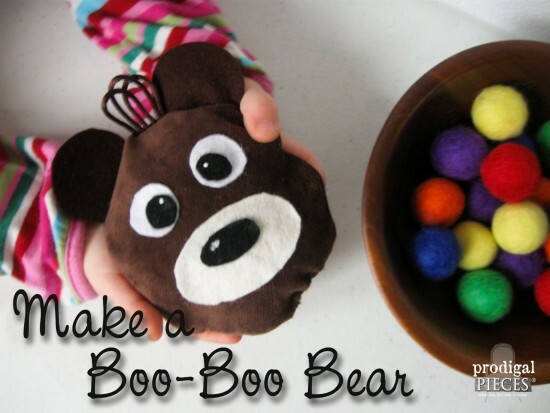 Meet Boo-Boo Bear, your child’s soft, cuddly friend who is ready to make those boo-boos go bye-bye. …and soothing when warmed for aching ears. The rice in the pack helps provide weighted pressure and feels as though he’s hugging your child, letting them know everything will be alright. In our house, we like to keep boo-boo bear in the freezer so he’s ready to aid our injured. And, it only takes a minute to warm him. When cold or warm, it is a moist temperature that lasts a long time. I use this same idea to make neck packs for my family, and let me tell you they are a treasured gift for sure! I know a few pint size people who will be getting a Boo-Boo Bear gift from me this year. Do pin and share so others can whip some up too! Thank you for having me over, Brittany! We love our Boo-Boo Bear and hope you will too. This is darling. I can see how it would make all boo boo’s feel all better! I love this and will be making them for each of the little people in my life!! How long do you nuke them to get them warm but not melt off the face? Yay! Happy to hear it. I would only do it for a minute or two…each microwave is different. Larissa, thank you so much for this sweet idea. Our Great-Granddaughter is 2 and I know she will love this from Grammy and Poppy. My pleasure! I gave these out at Christmas and they were a hit. Have fun with it!